When friends sent our family some delicious Chicago pizza this week as a thank you, it came delivered in dry ice. And Chris couldn't resist showing Cam how cool it would look evaporating in one of his play t ables! Of course, he got close, but did not touch. Another new experience for Cam was making finger jello with his nanny, Lisa. He couldn't believe he could touch the jello without it moving ! They made heart shapes and circles and even the neighbor girls enjoyed a taste. 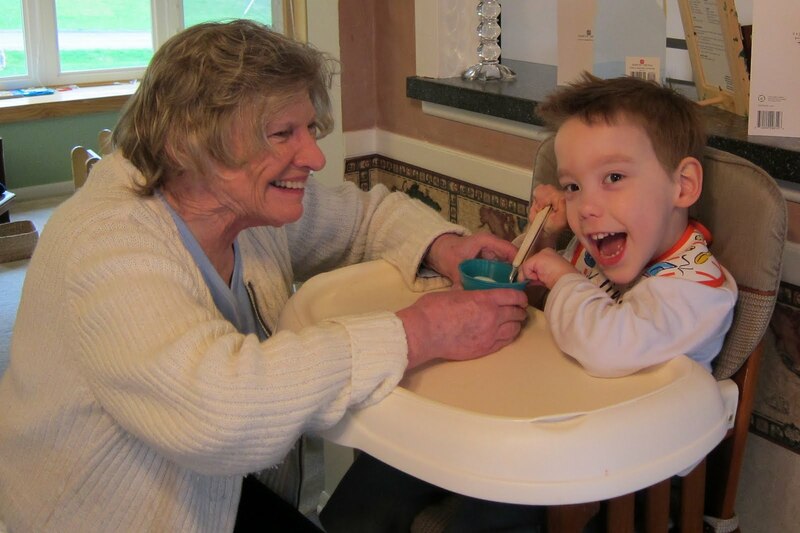 On Friday, it was time for Cam and Grandma to partake in their egg coloring tradition. Stirring the eggs around in the different c olors was Cameron's task. The outcome produced some vibrant eggs which Cam proudly displayed in his Sunday best. Easter is such a special celebration and this y ear Cam decided he would pick out some Easter flowers for his grandparents and Aunt Tracy. When asked if he also wanted to pick out flowers for his friend, Emma, he enthusiastically answered "yeah!" Cam chose a purple cala lily for his buddy. Grandma, Grandpa, and Aunt Tracy all drove into town to have Easter brunch with Cameron and his parents. After brunch, Cam opened a gift from Grandma & Grandpa- a music set, complete with a drum, tambourine, and harmonica. Their proud grandson was already shaking the tambourine, ready to begin his musical career!